For those that don't know, the Large Hadron Collider is a high energy particle accelerator that smashes atoms together to help understand the most intimate questions about physics and get a better understanding on how our universe was really created. The whole facility is 17 miles in circumference and is 570 feet below the Franco-Swiss border near Geneva. 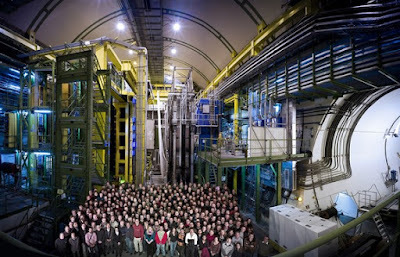 This machine was mostly developed by CERN (The European Organization for Nuclear Research). Headed by some of the world's top physicists, these guys have invested trillions of dollars to conduct these experiments. Religious fanatics are quick to condemn these projects saying that it is another way that humans are trying to play God. I'm sure thats what they always say when any great physicist from our history has made a significant breakthrough. What is the real reason they are trying to conduct these experiments? Why are they so interested in anti-matter? My theory is that governments around the world have been keeping secret alien technology that has either crash landed in their neck of the woods, or that has been given to them by alien beings themselves. Imagine if lets say the United States was given a space craft that runs on anti-matter. Where would we get this anti-matter to power the ship? This I believe could be where the collider comes in. Although that is all my speculation, we must also understand, that we have only recently proven that anti-matter exists and we did so by investing trillions of dollars into this machine. Why would our government or any other government invest so much money into something they didn't know even existed? This is why I speculate. The Large Hadron Collider is even in the movie Angels and Demons. I suggest everyone check that movie out for more information. Now that we have discussed a little bit about the goals of LHC, and how it came about, lets talk about the recent news about this collider. They have been watching a certain particle called the B meson. The B meson is a particle that is made up of one quark (which is a neutron or proton), along with its opposite quark, or the anti-matter partner. All normal particles are thought to have anti-matter partners. This is what physicists have now proven. The question is why does the anti-matter degrade? When the universe was created physicists believe there was an equal amount of both normal particles (matter) and their opposites (anti-matter). When the big bang occurred, both of these particles slammed together, and now all that remains is the matter, the anti-matter has all degraded and can no longer be found in the wild. Physicists are now looking at this process first hand, and all it does is open the door for more questions. How can we harness the matter creating energy of these anti-matter particles. How can we store these particles without them degrading into nothingness? Your guess is as good as mine. I am no physicist, and only have a minuscule understanding of what is really going on. I just want to give the news to my fellow readers, and let you know what I think on the matter. Or anti-matter I should say. I hope you have enjoyed reading this article. Please let me know what you think in the comments, feel free to speculate as much as you want, as I have.